For decades nursing has debated the mandatory BSN (Bachelor of Science in Nursing) as a means to elevating nurses to a full professional status. During this same time period, there has been significant research studying the effects of bachelor prepared nurses and improved patient outcomes. Both have been supported as a necessary path to pursue in improving patient care and outcomes. On the other hand, the debate amongst nurses has also carried on for decades as to which nurses provide better quality bedside care and which nurses are better prepared for managerial and leadership roles. Sadly, what is often missed is that the BSN is not just about leadership and managerial nursing; and the ADN is not just about bedside care. Best-practices, patient-centered care and improved patient outcomes have become the driving force behind advanced education requirements. The discussion began over 50 years ago when the American Nurses Association published its first position paper on the subject. The ANA recommended the BSN as minimal educational requirement for RNs and has been pushing for years for 80% of nurses to have their BSN by 2020. Other regulatory and accrediting agencies also began recommending the BSN due to the fact that medicine is continuing to evolve technologically, and nurses are assuming more and more complex responsibilities in patient care. Patient stays have become shorter in length, with more sophisticated levels of care and higher acuity levels. Consequently, patient care is more complex, and nurse’s responsibilities have expanded exponentially with more focus on patient education and higher tech procedures and treatments. To meet the need for advancing education, many states implemented stricter continuing education requirements and researchers have studied the effects on patient outcomes when they had nurses with higher levels of education. As the research started to show lower morbidity rates and improved outcomes, more and more emphasis on higher levels of education evolved. In 2010, the Institute of Medicine (IOM) issued a report detailing what it foresees as The Future of Nursing: Leading Change, Advancing Health. This report highlights the changing face of healthcare and how nursing must change to meet the needs of the advancing health care system. Part of the IOM recommendation is to increase the number of BSNs by 2020. At the time of that report, roughly 50% of nurses in the workforce had a BSN. Currently, between 55 and 60% of the workforce have a BSN. It is estimated that 75% of Baby Boomer nurses do not have their BSN. Today 900,000 of the 3 million nurses in the workforce are over 50 years of age. As this generation of nurses retire, the calculation changes and the percentage of BSN nurses will rise. In 2008, 35% of new grads had attained a BSN; in 2013, 55% were BSN grads. 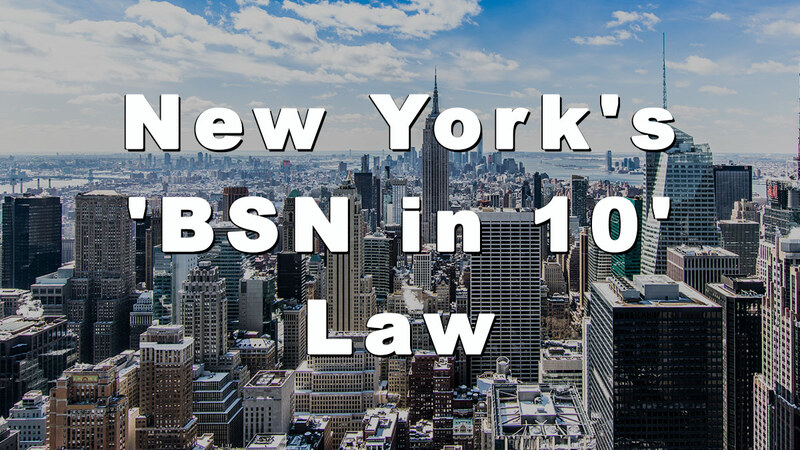 Recently, the state of New York took the issue one step further by passing the first law (nicknamed “BSN in 10”) stating that by 2020, all new grad registered nurses must either have a BSN or must complete their BSN within 10 years of their date of graduation. The law became effective December 19, 2017 and becomes mandatory within 18 months. All nurses licensed in New York prior to the effective date (12/19/17) as well as students enrolled in a diploma or ADN programs are grandfathered in as long as they maintain their license in good standing. However, they are encouraged to continue their education as well. Other states such as New Jersey are having discussion in their legislatures about requiring the “BSN in 10.” Expect to see legislation begin to appear in many states over the next five years. Advances in health care have been proven to require advanced education and competencies for nurses and implementing a mandatory BSN law moves in the direction of ensuring nurses are able to meet the growing demands. Patient outcomes have been factored in to financial incentives and rewards for hospitals and other facilities and agencies as the need to drive down costs of health care in America have been demanded by insurance companies and government oversight agencies. Advances in patient care involves transitioning from a skill-based competency to that of critical thinking, decision making, collaboration, teamwork and evidence-based practice. Nurses need to incorporate a strong knowledge base of health care policy and patient-centered care into their everyday practice. Leadership skills are important for every nurse as patient’s care extends far beyond the bedside. Educating patients on how the health care system works, how he needs to learn and employ that knowledge into his everyday life in order to prevent complications and establish a healthier lifestyle for himself and reap the rewards of improved outcomes. Nurses are the backbone of the healthcare industry and must grow in order to meet the challenges of the future and improve patient outcomes. Advanced education is the key to this. The philosophy of the BSN program emphasizes that nursing is a lifelong learning experience and promotes continuing education for nurses. As medicine evolves, nurses need to keep pace with the changes and advances in order to meet the needs of their patients. Looking forward, the IOM has predicted the need for more nurses to be BSN prepared in order to meet these needs. The changing face of patient populations presents an increased demand for higher-skilled BSN nurses. For instance, the population is aging and represents a growing number of patients with more and more complex health care needs than other segments of the population. This segment over 65 was calculated at 46 million in 2016. That number is expected to double by 2060. Those over 65 are a much more diverse group racially and ethnically. Their poverty level is much lower. They are better educated and more sophisticated and are also demanding attention to detail and higher quality especially in health care. BSN nurses are better prepared to meet these standards and needs. The American Association of Colleges of Nurses (AACN) published a report (Impact of Education on Nursing Practice) in 2014 citing research findings that show trends for improved patient outcomes including a lower mortality rate. Additional studies showed that for each 10% increase in BSN prepared nurses, the mortality rate in surgical patients drops an additional 5% due to improved nursing interventions in complex care. The BSN is not just about leadership and management roles, many specialty areas of nursing such as oncology and rehab have been requiring a BSN for some time. Hospitals have begun to hire primarily BSN prepared nurses as they build out the workforce as well as replace nurses leaving their employment. However, ADN and Diploma nurses should not despair, BSN programs remain impacted and combined with the shortage of nurse educators continues to affect the number of BSN nurse graduates possible. Enrollment in BSN programs have tripled over the past decade but it’s going to be a long process to build a large enough workforce of BSN prepared nurses, and by then most of the ADN and Diploma nurses will either become BSN-prepared or be preparing to retire. Anyone considering a career in nursing is advised to attain as much education as possible to widen the scope of their roles.